The cartoons for Les Triomphes des Dieux, one of the greatest Gobelins series, were painted by the court artist Noel Coypel (1628-1707). He was commissioned to adapt the designs from a series of sixteenth century Brussels tapestries attributed to Giulio Romano, which had been acquired by Louis XIV in 1673 from a sale of the property of the King of Poland. These tapestries are still conserved in the Mobilier National. Couple commenced work on this important project in 1684 and the Gobelins account books record regular payments made to him until 1695. The completed design for the grandest panel, Le Triomphe de Venus, was finally delivered in 1693. The present tapestry was woven in the haute lisse workshops of Jans the Younger. Work was started in 1705 and the panel was completed in 1713. It was the last tapestry from this cartoon to be woven at Gobelins. The design is composed of three tiers: in the centre of the middle tier stands the goddess Venus before a throne on a twin prowed vessel with pierced sides and furling sales. She holds a view; at her feet are two putti each offering a dove. She is flanked by nymphs standing at flaming tripods. The lower tier is dominated by Neptune, trident in hand, riding his shell chariot drawn by sea horses, surrounded by water centaurs. Above Venus are piping and dancing putti, some shooting arrows and several birds flying in the brilliant blue sky. 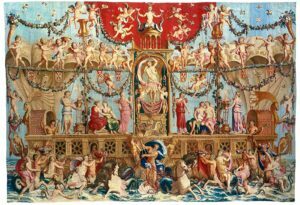 The other tapestries in the series of Les Triomphes des Dieux are Bacchus, Apollo, Minerva, Mars, Hercules, Religion and Philosophy. Seven complete sets were woven at Gobelins between 1684 and 1713. Fenaille traced the whereabouts of earlier Le Triomphe de Venus panels. These were in the following public collections: Fontainebleau; Musée des Offices, Florence; Colonial Ministry, Paris; French Academy, Rome; Garde-Meuble, Paris. The set of which the present tapestry formed a part was finally completed in 1714 and was presented to Baron de Sparr, ambassador to Sweden in 1717 by an order signed by Phillipe d’Orléans. As part of the refurbishment of the embassy, the set was returned in exchange for a set of the Months of Lucas. These tapestries remained in store and appear in the Gobelins inventories of 1736 and 1740. They were next lent in January 1741 to the maréchal de Belle-Isle. The order releasing the tapestries was signed by the doc de Nivernois. It is recorded that the set was again returned to Gobelins in August 1743. The set was then lent to the French ambassador in Rome in 1748. The order signed by M. de Tournehm survives in the French National Archives. Furthermore, an interesting letter survives from M. de Vandières (marquis de Marigny), giving information on these tapestries at the time os a change of ambassador. Monsieur le duc de Nivernois vous donna, Monsieur un récépissé, le 4 septembre 1748, des tapisseries de Gobelins que le Roy lui resta pour son ambassade de Rome, renvoyez moi ce récépissé que M. le duc de Nivernois demande, ou s’il n’est pas dans vos mains, mandez moy à qui vous l’avez remis, qu’il puisse être rendu a M. le duc de Nivernois, M. l’ambassadeur qui doit le remplacer dans son ambassade donnera un même récépissé si le Roy lui accorde la même grâce. 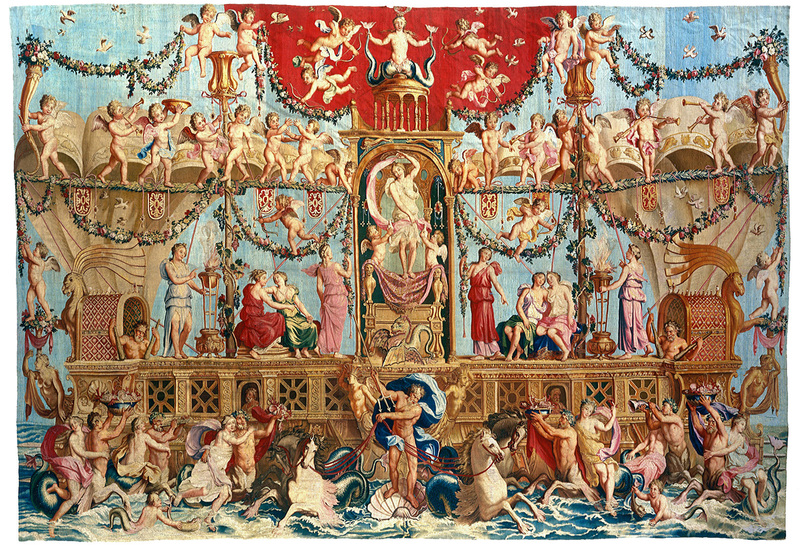 The tapestries remained in Rome at the Embassy and according to the Gobelins inventories, were the responsibility of the then ambassador, cardinal de Bernis. It is believed that the set was sold during the revolution as was other property from the Embassy. Benefit Dictionnaire des Peintres, Sculpteurs Dessinateurs et Gravures. (Paris 1966). Cobban A History of Modern France. Vol 1. (London 1957). Darcel Les Tapisseries Décoratives du Garde-Meuble. Vol II. (Paris). Fenaille Etat général des tapisseries de la Manufacture des Gobelins depuis son origine jusqu’à nos jours 1600-1900. Vol II. (Paris 1903). Göbel Wandteppiche. Part II. (Leipzig 1933/4). Leland Hunter The Practical Book of Tapestries. (Philadelphia 1925). Weigert French Tapestry. (London 1962). This entry was posted in Featured Tapestry and tagged Tapestry on August 19, 2016 by fransestapestryarchive. © Copyright 2016 Franses Tapestry Archive.